There’s a strong feeling or connection to The Social Network in this film. Sure Aaron Sorkin is a co-writer, and sure it depicts an insider view of the business side of a popular entertainment industry, but thematically Billy Beane and Mark Zuckerberg are like two sides of the same coin. While diametrically opposed in age, looks and charisma, they are both ambitious new millennium businessmen subverting the anachronistic stubbornness of their old world establishments. For Mark Zuckerberg it was Harvard and the elitist old boys club that eluded him, and for Billy Beane it’s the institution of baseball - America’s past time and its long standing traditions of sportsmanship and integrity. What makes baseball such a dynamic sport is the combination of physical precision on the field and the detailed statistical analysis available for almost every aspect of the game, a sport in which the long standing consistency of the game means players across eras are comparable more than in any other sport. 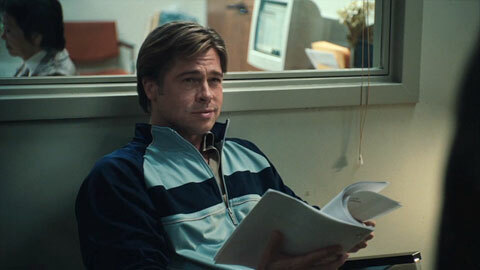 In Moneyball Brad Pitt depicts the situation of real-life Oakland A’s General Manager Billy Beane, who in 2002 finds himself up against this tradition due to an inadequate salary budget causing him to lose his three best players to other richer teams. Beane changes history by looking outside of the box to a new school of baseball analysts, who, through the analysis of statistics, find undervalued players and thus maximizing their winning potential. Michael Lewis’s non-fiction novel, which served as the basis for the film, was indeed a baseball nerd story. But under the pen of Steve Zaillian and Mr. Sorkin, the direction of Bennett Miller and the overall production guidance of producer Brad Pitt, Moneyball is a thoroughly entertaining combination of sports movie-dramatics, underdog melodrama and a tender father-daughter drama. Beane’s relationship with Yale economics grad, Peter Brand (Hill), who becomes Beane’s statistics guru and brains behind the new regime, results in most of the comedy. The appearance of the pudgy, unathletic baseball nerd entering an ego-fuelled world of sports and its ubermen plays for fun comedy. Otherwise, Beane’s journey is filled with conflict at every corner. Philip Seymour Hoffman’s performance as the old school Art Howe, who refuses to be taught new tricks is spot on. Same with the stodgy old baseball scouts who judge a player on looks, 'feelings' and other non-statistical criteria. It perhaps dumbs down the contribution of this old guard but serves the picture well. Brad Pitt single-handedly holds down this picture arguably better than any film he's ever been. His handsome conservative look and affable and easy-going personality lead to maximum leading man charm. It's the type of charm that can go overlooked critically but is essential to the success of a film. While the baseball story succeeds handsomely, there's also a number of missed opportunities. Other than Pitt and his daughter, his relationships with the other characters provides insufficient drama and closure. Peter Brand in particular is sorely underdeveloped as a character. Same with Beane's tempestuous relationship with Art Howe, which is left hanging and not reconciled. That said, the whole is greater than the sum of the parts in this case. It's a lengthy running time, which never drags, leaving us with good wholesome feelings of satisfaction and inspiration at the end.